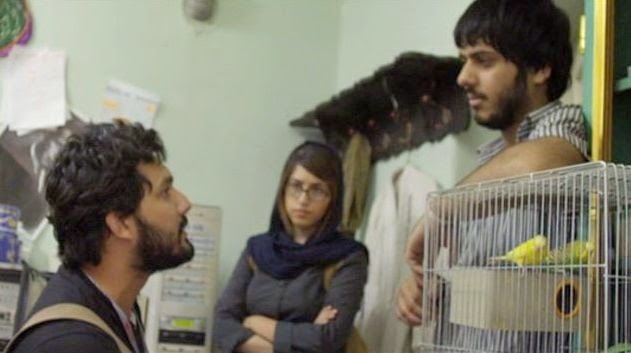 When I first heard about Bahman Ghobadi’s No One Knows About Persian Cats (Kasi az Gorbehaye Irani Khabar Nadareh, 2009), I understood it to be a musical tour through the underground pop music scene in contemporary Tehran – difficult to make, of course, but not an extraordinary piece of cinema. But actually the film turned out to be much more than that. This film, which received “Un Certain Regard Special Jury Prize Ex-aequo” at the 2009 Cannes Film Festival, is a one-of-a-kind examination of youthful creativity that deserves to become a classic. Shot on the fly and on the run in 17 sessions and without the official permit required by the government, Ghobadi and his crew have managed to put together not just an investigation into a suppressed aspect of modern Iranian culture, but more than that, a multi-layered narrative about the universal drive to express deep feelings through poetry and music – something for which Iranians have always had a passion. Naturally, the circumstances behind the filming are interesting in their own right. Given the fact that they were all working without government permission and on a subject matter, modern rock-and-roll musical expression, that the conservative authorities want to prohibit, the film crew had to shoot their scenes rapidly and be ready for disruptions at any time. A good feeling for the way in which Ghobadi operated is provided by the documentary film, Behind the Scenes of Nobody Knows about the Persian Cats, by Kavoos Aghaei – a documentary about a documentary . From it we can see that Ghobadi has a conceptual feeling about what he wants from a scene, but he visualizes it from multiple alternative camera perspectives, and he frequently changes his mind and improvises during the filming. Although some of the scenes were blocked out for the camera setups, they were not rehearsed before shooting. In fact Ghobadi began shooting the film when co-scriptwriter Hossein M. Abkenar had only finished the first half of his script . This required adaptability on everyone’s part. In particular, the contributions of cinematographer Touraj Aslani (Mansuri) (Hamoun, 1990; Satoori, 2007; Song of the Sparrows, 2008) deserve special mention. He used only a single camera with a single lens throughout the filming, and there were no fixed camera (tripod) settings – all the photography was handheld. From Aghaei’s documentary we can see that Aslani had to continually prowl around very close to the characters he was shooting, all the while maintaining proper compositions and a steady image. The story revolves around the activities of three principal characters. Negar and Ashkan (played by Negar Shaghaghi and Ashkan Koshanejad – they play themselves) are an attractive young couple who perform Indie rock music together. They seek to get out of Iran and play in a country that will allow them to perform. Nader (played by Hamed Behdad) is an energetic black-market entrepreneur who sells bootlegged CDs and DVDs and organizes underground performances – for a fee, of course. Behdad was the only professional actor in the film, and his spirited performance is crucial to the film’s narrative energy, particularly in contrast to the laid-back demeanors of many of the other performers in the film. The fact that Behdad is also pop music performer in real life undoubtedly contributed to his understanding of the milieu of his character. The film begins with two brief successive scenes that are presented before the main title and credits are presented and lie outside the main story that follows. The first scene shows a seriously injured man in an ambulance, and this will connect with the final shots at the end of the film. The second scene shows an underground rock studio where Bahman Ghobadi, himself, is rehearsing some material. The musician watching him, Babak Mirzakhani, remarks to a friend that Ghobadi has come to the studio to take his mind off his problems getting a permit to make his next movie, which he wants to base on a real-life police bust of an underground that resulted in 400 arrests. The use of self-reflective scenes that cast an ironic light on the film that you are watching has been conspicuously used before by Abbas Kiarostami in Close-Up (1990), Through the Olive Trees (1994), and Taste of Cherry (1997). So we can see his influence on his proteges by the fact that two of his early assistants who have gone on to great directorial success on their own, Jafar Panahi in The Mirror (1997) and Bahman Ghobadi here, have also played with this technique. After the titles are shown, the main story proceeds. 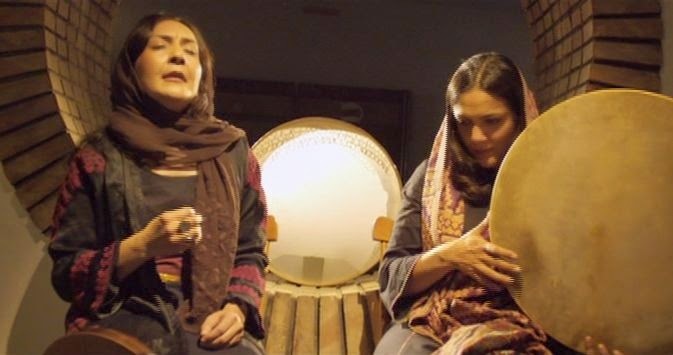 In an early scene, Negar and Ashkan, who have just gotten out of prison, go to that same studio where Babak Mirzakhani was watching Ghobadi and tell him about their hopes to perform at a concert in London. They need to find backup musicians for their Indie rock group,“Take It Easy Hospital”, that performs their compositions, and they need a passport for Ashkan. In Iran a young man cannot leave the country without having performed his military service, so they need a military certificate, too. Babak points them to the man who can help them out, Nader, the bootlegger. Nader is all confidence. After he (and we) listens to a CD of their music with approval, he tells them that he can solve all their problems. He says that there are 312 Indie rock groups in Iran and 2,000 pop music groups and says that he knows everybody. He can find the counterfeit documents and backup musicians that they need. 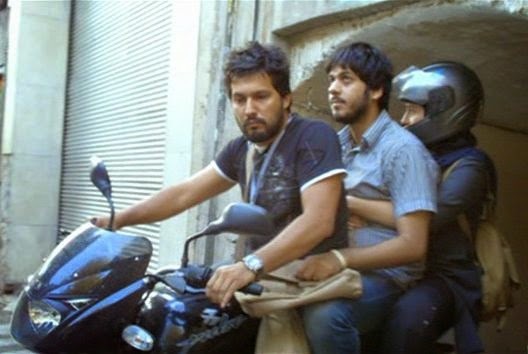 So he takes the two of them on the backseat of his motorcycle, careening through the Tehran traffic to his various underground contacts. Whenever Nader takes them to a new music group, we hear some of their music – sometimes “live” while they are playing it and sometimes accompanied by various visual montages of the contemporary urban scene in Tehran. These various musical cuts in the film are not full-length songs, but they are long enough to set a mood, and collectively they maintain the positive spirit of hopefulness that pervades the film. One of the singers Nader takes them to is Raana Farhan, a famous recording artist in Iran, whose contacts, Nader believes, may be valuable. He also takes them to a colorful old counterfeiter, who is in the business of making false documents. His costs are not based on his production expenses, but on whatever the market will bear, which for a military certificate or a US passport is a fortune. Another group they visit is “Yellow Dog”, which later emigrated from Iran to the US . The underground musicians that they visit all have the problem of playing their music in some place where the authorities or nosey neighbours cannot hear them. Some of the build soundproof studios in basements or lofts. Others manage to find musical sanctuary in a dairy farm outside of town. Given all of Nader’s activities, the inevitable happens and he is picked up by the police for bootlegging immoral DVDs and sentenced to 75 lashes and an enormous fine. But in Iran, I have sometimes been told, everything is negotiable. Nader desperately begs and wheedles with his (unseen) magistrate, pleading for mercy. Amazingly, he manages to talk his way out of his tough sentence and only winds up paying a minor fine. By this time, if not before, one realizes that Nader is the star of the film. In order to raise money to pay for their documents, Nader organizes a concert, for which he hopes to get a certificate of authorization from the government. He takes Negar and Ashkan to see some more musicians, some of whom are not Indie rock performers, but are interesting nonetheless. These include a soulful balladeer (Shervin Najafian), who does charity work and two sisters who manage to put on performances in their own home in order to escape pressure from the authorities. They also hear Babak Mirzakhani, of the Mirza Band, belt out a blues lament in Farsi. Then Nader takes them to a country site and sings a soulful song with his own group, complete with accompanying traditional dancers. My favourite, however, is the native Farsi rapper, Hitchkas, who punches out rhythmic odes to modern urban frustration. I am not a big fan of rap, but Hitchkas is the best rapper I have heard. In the final act things begin to fall apart. Nader, in financial straits, is forced to sell his beloved motorcycle. The gangster counterfeiter David gets busted by the police before he can deliver the documents. Meanwhile Negar and Ashkan are busy preparing for their big money-making concert which is to be held in a clandestine studio. It all comes to a climax that wasn’t what our protagonists wanted. The music in No One Knows About Persian Cats comes in many stripes, some of it, particularly the Indie rock music, sung in English and some in Farsi. I found all of it enjoyable. But the film has a more important dimension than just showcasing contemporary music. This is the representation of youthful enthusiasm for self-expression in music and poetry. These musicians are not rebels, and they consciously avoid singing songs that may contradict Islamic morals or have political or social subject matter. Most of their songs are about the joys and woes of life, itself – the subject matter of poets down through the centuries. Note that Ghobadi has not made a political tract. Instead this film is more universal and is a testament to optimism and hope – as expressed by performers who have the urge to present their feelings in musical form. Despite the difficult conditions under which the film was made, it is a work of art. Editing the film, which was mostly done in Berlin, must have been difficult, but the outcome is excellent. The narrative continuity comes through. The various montage sequences that accompany many of the musical pieces are mostly superb and enhance the overall presentation. But of course, there is a political dimension that cannot be denied. The characteristic calls for freedom that underlie all of Ghobadi’s films are just what the Iranian authorities do not want to hear and see. Over the past century, ruling syndicates such as Stalinism and Maoism claimed to be based on higher-order principles dedicated to our well-being; but they misused the principles by invoking them only selectively, as a cudgel, for punitive and coercive control. Religions can be misused in this way, too. From the autocratic syndicate’s perspective, even thinking independently and expressing oneself is considered subversive . 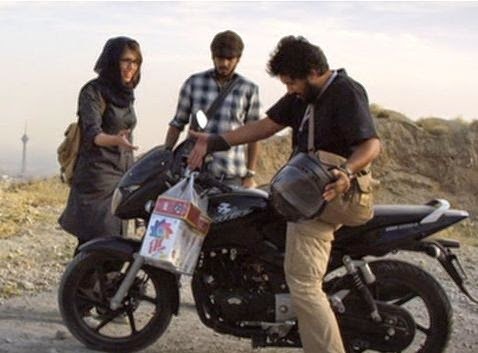 For those dedicated to free expression, this represents a challenge; and how one responds to it lies at the heart of a regrettable falling out between Ghobadi and Kiarostami . So opinions vary. The authorities evidently believe that No One Knows About Persian Cats is contaminating and damaging to Iran. In my view the film merely celebrates the lyrical and creative vitality of Iranian youth, and by doing so it is elevating. Note this title's reference to the original English title of its subject matter. This documentary is available on the DVD of No One Knows About Persian Cats distributed by iFC Films, New York. The screenplay credits also include Ghobadi and his close companion, Roxana Saberi. Emily Greenhouse, “An Iranian Tragedy in America”, The New Yorker, November 13, 2013. John Albert, "Repatriating The Yellow Dogs: what happened to Iran's rock stars slain in New York? ", The Guardian, Tehran Bureau, November 11, 2014. Ramin Jahanbegloo, “'I am not a spy. I am a philosopher. ', 125 Days in an Iranian Prison”, The Chronicle Review, 3 October 2014. Ramin Jahanbegloo, Time Will Say Nothing: A Philosopher Survives an Iranian Prison, University of Regina Press, Saskatchewan, Canada, 2014. In a nutshell as I understand it, the dispute was over who was “selling out” (my words, not theirs). Kiarostami suggested that by leaving his home country and culture, Ghobadi was abandoning his artistic mission. 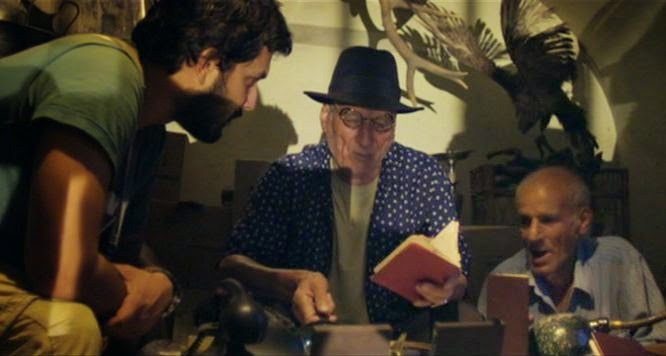 Ghobadi's response was basically that (a) he had no choice about leaving the country and (b) Kiarostami, by muffling his artistic voice and cooperating with the authorities inside the country, was doing something that Ghobadi in good conscience could never do. See Rasmus Christian Elling, “Catfight? Or Time for A New Direction in Iranian Cinema?”, Copenhagen University Middle East and Islam Network (CUMINet), November 9, 2009.